mushrooms, bamboo shoots, red peppers, string beans, carrots, basil leaf in Red curry. pineapple chunk, onion, bamboo shoots, baby corn, straw mushrooms, summer squash in yellow curry. Thin sliced beef sirloin in spicy Panang curry sauce with mushroom, baby corn, green bean, lemon leaf, basil leaf. 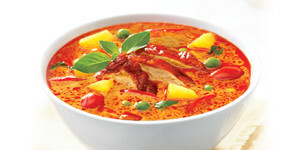 Sliced boneless roasted duck in special red curry with bell pepper, green beans,carrots, basil leaf. squash, red pepper, baby corn, carrots, onion. Varieties of seafood with assorted vegetables in Southern style curry sauce. String bean, green pepper, eggplant, green pea, bamboo shoots,basil leaf. Sweet potato, onion, carrots, roasted peanuts in Massaman curry sauce.